Jen Randall made the cutest Valentine's Day Canvas. Such a great Valentine decoration or gift! Jenn picked up a wooden heart frame at Michaels for just $1. She used a piece of 12 x 12 paper from the Mixed Media paper pad and glued it to the frame, she then used the frame as a template to cut the paper out first. (used Mod Podge to glue the paper down) She then added some white gesso on top and a bit of watercolor around the edge of the heart opening to make it stand out a bit. (such a great touch to make it pop) The half circles on the top & bottom also have gesso on top to tone down the boldness of the black and white chevron a bit. The other papers, including the 'love', are from the Kraft Wedding paper pad. 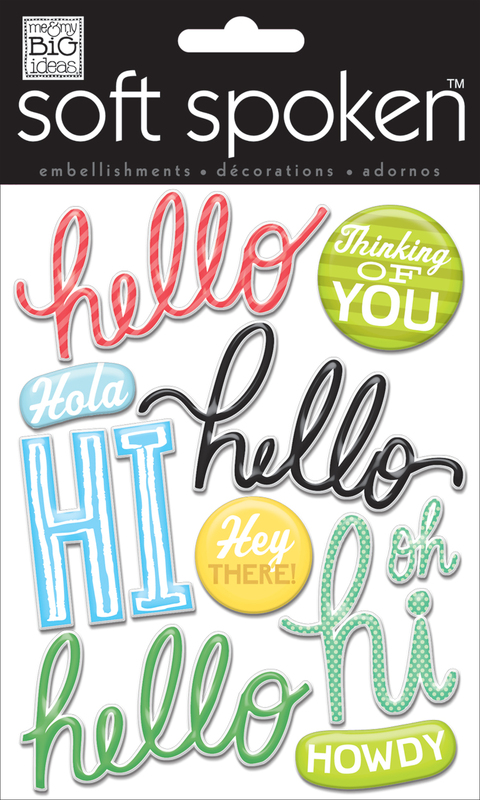 Then to finish it off she added some of the puffy stickers, mambi STICKS™ and the 'hello' from our new soft spoken™ that is also available at Michaels stores. Such a great decoration!!! Love it! Jenn also made this adorable gift tag below to go onto a jar of chocolate. She used our CARDS in an INSTANT™ pink love card that is available at Michaels, along with the FREE PRINTABLE! So many cute ideas! Happy crafting and Happy Valentine's Day!